The recast graph is based on Recast (http://code.google.com/p/recastnavigation/). 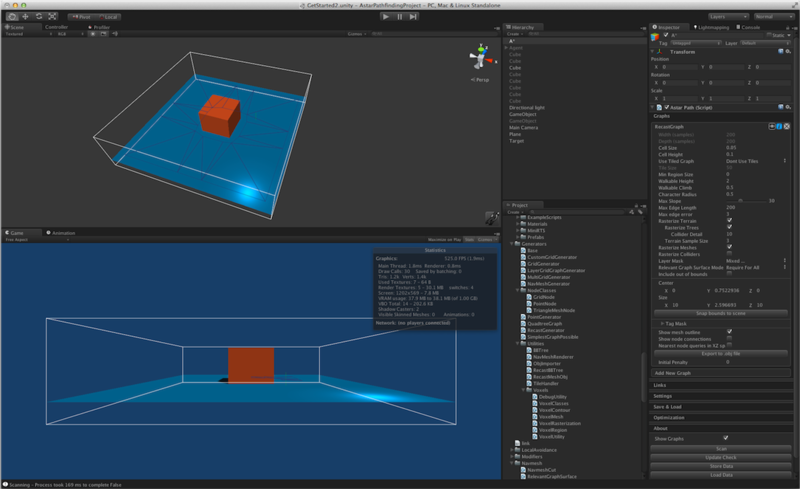 I have translated a good portion of it to C# to run it natively in Unity. When generating a recast graph what happens is that the world is voxelized. You can think of this as constructing an approximation of the world out of lots of boxes. If you have played Minecraft it looks very similar (but with smaller boxes). The voxel mold is build from the input triangle mesh by rasterizing the triangles into a multi-layer heightfield. Some simple filters are then applied to the mold to prune out locations where the character would not be able to move. The walkable areas described by the mold are divided into simple overlayed 2D regions. The resulting regions have only one non-overlapping contour, which simplifies the final step of the process tremendously. The navigation polygons are peeled off from the regions by first tracing the boundaries and then simplifying them. 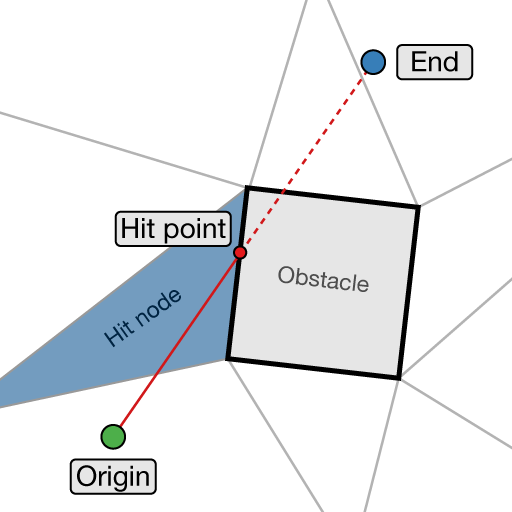 The resulting polygons are finally converted to convex polygons which makes them perfect for pathfinding and spatial reasoning about the level. It works exactly like that in the C# version as well, except that everything is triangulated to triangles instead of n-gons. The recast generation process usually works directly on the visiable geometry in the world, this is usually a good thing, because world geometry is usually more detailed than the colliders. You can however specify that colliders should be rasterized, if you have very detailed world geometry, this can speed up the scan. Check out the second part of the Get Started Tutorial which discusses recast graphs. In the editor there is a button for exporting the generated graph to a .obj file. Usually the generation process is good enough for the game directly, but in some cases you might want to edit some minor details. So you can export the graph to a .obj file, open it in your favourite 3D application, edit it, and export it to a mesh which Unity can import. You can then use that mesh in a navmesh graph. Since many 3D modelling programs use different axis systems (unity uses X=right, Y=up, Z=forward), it can be a bit tricky to get the rotation and scaling right. For blender for example, what you have to do is to first import the mesh using the .obj importer. Don't change anything related to axes in the settings. Then select the mesh, open the transform tab (usually the thin toolbar to the right of the 3D view) and set Scale -> Z to -1. If you transform it using the S (scale) hotkey, it seems to set both Z and Y to -1 for some reason. Then make the edits you need and export it as an .obj file to somewhere in the Unity project. But this time, edit the setting named "Forward" to "Z forward" (not -Z as it is per default). Changes the bounds of the graph to precisely encapsulate all objects in the scene that can be included in the scanning process based on the settings. Which objects are used depends on the settings. If an object would have affected the graph with the current settings if it would have been inside the bounds of the graph, it will be detected and the bounds will be expanded to contain that object. 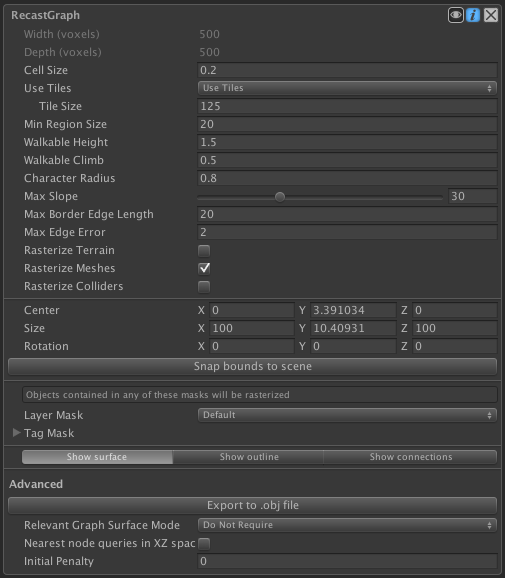 This method corresponds to the 'Snap bounds to scene' button in the inspector. The cell size is the width and depth of those boxes. The height of the boxes is usually much smaller and automatically calculated however. See CellHeight. Lower values will yield higher quality navmeshes, however the graph will be slower to scan. Radius of the agent which will traverse the navmesh. The navmesh will be eroded with this radius. Controls detail on rasterization of sphere and capsule colliders. This controls the number of rows and columns on the generated meshes. A higher value does not necessarily increase quality of the mesh, but a lower value will often speed it up. You should try to keep this value as low as possible without affecting the mesh quality since that will yield the fastest scan times. Max distance from simplified edge to real edge. This value is measured in voxels. So with the default value of 2 it means that the final navmesh contour may be at most 2 voxels (i.e 2 times cellSize) away from the border that was calculated when voxelizing the world. A higher value will yield a more simplified and cleaner navmesh while a lower value may capture more details. 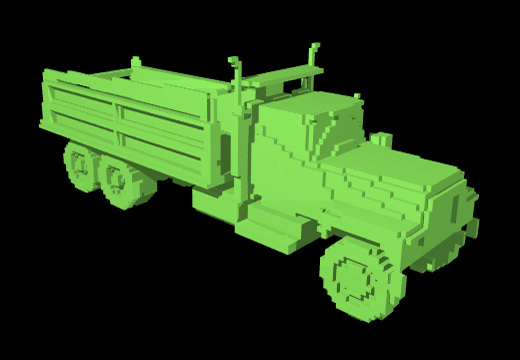 However a too low value will cause the individual voxels to be visible (see image below). Size in voxels of a single tile. This is the width of the tile. A large tile size can be faster to initially scan (but beware of out of memory issues if you try with a too large tile size in a large world) smaller tile sizes are (much) faster to update. Different tile sizes can affect the quality of paths. It is often good to split up huge open areas into several tiles for better quality paths, but too small tiles can also lead to effects looking like invisible obstacles. For more information about this take a look at Notes about navmesh graphs. Usually it is best to experiment and see what works best for your game. When scanning a recast graphs individual tiles can be calculated in parallel which can make it much faster to scan large worlds. When you want to recalculate a part of a recast graph, this can only be done on a tile-by-tile basis which means that if you often try to update a region of the recast graph much smaller than the tile size, then you will be doing a lot of unnecessary calculations. However if you on the other hand update regions of the recast graph that are much larger than the tile size then it may be slower than necessary as there is some overhead in having lots of tiles instead of a few larger ones (not that much though). Recommended values are between 64 and 256, but these are very soft limits. It is possible to use both larger and smaller values. Layer mask which filters which objects to include. Longer edges will be subdivided. Reducing this value can sometimes improve path quality since similarly sized triangles yield better paths than really large and really triangles small next to each other. However it will also add a lot more nodes which will make pathfinding slower. For more information about this take a look at Notes about navmesh graphs. Max slope in degrees the character can traverse. Small regions will be removed from the navmesh. Measured in square world units (square meters in most games). If a region is adjacent to a tile border, it will not be removed even though it is small since the adjacent tile might join it to form a larger region. Use colliders to calculate the navmesh. Use scene meshes to calculate the navmesh. Include the Terrain in the scene. Rasterize tree colliders on terrains. If the tree prefab has a collider, that collider will be rasterized. Otherwise a simple box collider will be used and the script will try to adjust it to the tree's scale, it might not do a very good job though so an attached collider is preferable. It seems that Unity will only generate tree colliders at runtime when the game is started. For this reason, this graph will not pick up tree colliders when scanned outside of play mode but it will pick them up if the graph is scanned when the game has started. If it still does not pick them up make sure that the trees actually have colliders attached to them and that the tree prefabs are in the correct layer (the layer should be included in the layer mask). Require every region to have a RelevantGraphSurface component inside it. If this is set to OnlyForCompletelyInsideTile a navmesh region is included in the navmesh if it has a RelevantGraphSurface inside it, or if it is adjacent to a tile border. This can leave some small regions which you didn't want to have included because they are adjacent to tile borders, but it removes the need to place a component in every single tile, which can be tedious (see below). If this is set to RequireForAll a navmesh region is included only if it has a RelevantGraphSurface inside it. Note that even though the navmesh looks continous between tiles, the tiles are computed individually and therefore you need a RelevantGraphSurface component for each region and for each tile. In the above image, the mode OnlyForCompletelyInsideTile was used. Tile borders are highlighted in black. Note that since all regions are adjacent to a tile border, this mode didn't remove anything in this case and would give the same result as DoNotRequire. The RelevantGraphSurface component is shown using the green gizmo in the top-right of the blue plane. In the above image, the mode RequireForAll was used. No tiles were used. Note that the small region at the top of the orange cube is now gone, since it was not the in the same region as the relevant graph surface component. The result would have been identical with OnlyForCompletelyInsideTile since there are no tiles (or a single tile, depending on how you look at it). The mode RequireForAll was used here. Since there is only a single RelevantGraphSurface component, only the region it was in, in the tile it is placed in, will be enabled. If there would have been several RelevantGraphSurface in other tiles, those regions could have been enabled as well. Here another tile size was used along with the OnlyForCompletelyInsideTile. Note that the region on top of the orange cube is gone now since the region borders do not intersect that region (and there is no RelevantGraphSurface component inside it). When not using tiles. OnlyForCompletelyInsideTile is equivalent to RequireForAll. Rotation of the graph in degrees. If true, scanning the graph will yield a completely empty graph. Objects tagged with any of these tags will be rasterized. Note that this extends the layer mask, so if you only want to use tags, set mask to 'Nothing'. Controls how large the sample size for the terrain is. Size of a tile along the X axis in voxels. Size of a tile along the Z axis in voxels. If true, divide the graph into tiles, otherwise use a single tile covering the whole graph. Since 4.1 the default value is true. Height the character can climb. No RelevantGraphSurface components are required anywhere. Any surfaces that are completely inside tiles need to have a RelevantGraphSurface component positioned on that surface, otherwise it will be stripped away. All surfaces need to have one RelevantGraphSurface component positioned somewhere on the surface and in each tile that it touches, otherwise it will be stripped away. Only tiles that have a RelevantGraphSurface component for that surface will keep it. Convert character radius to a number of voxels. Create a tile at tile index x, z from the mesh. 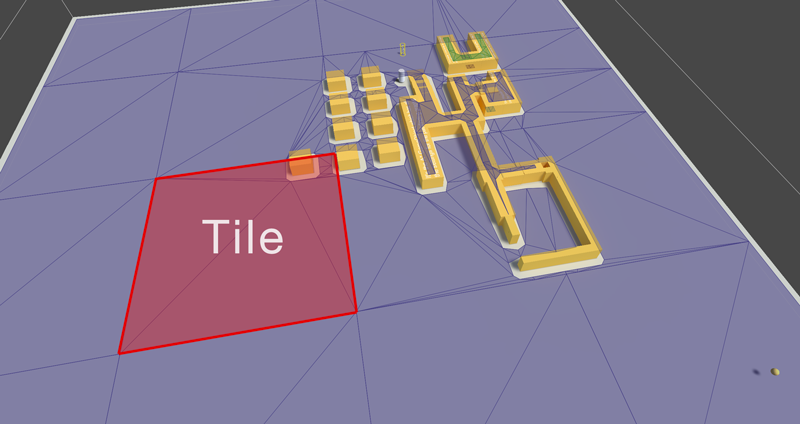 Creates a list for every tile and adds every mesh that touches a tile to the corresponding list. List of tiles that have been calculated in a graph update, but have not yet been added to the graph. When updating the graph in a separate thread, large changes cannot be made directly to the graph as other scripts might use the graph data structures at the same time in another thread. So the tiles are calculated, but they are not yet connected to the existing tiles that will be done in UpdateAreaPost which runs in the Unity thread. Number of extra voxels on each side of a tile to ensure accurate navmeshes near the tile border. Called on the Unity thread to complete a graph update. Returns the closest point of the node. Returns if the point is inside the node in XZ space. World bounds for the graph.